Siena, 이탈리아의 카사 디 오슬로 | 호스텔월드에서 예약하세요. Casa di Osio is a wonderful, cozy and bright B&B situated in the heart of Siena. 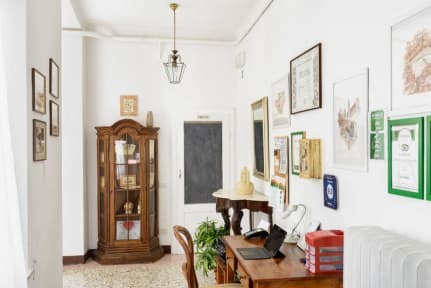 Completely renewed and restored , it is located in a notified palace built on 1313, in the initial part of the main street of the city, Via Montanini. Very close to Piazza del Campo, to the Cathedral, to all the museums and also close to the Chianti area, Casa di Osio is the perfect place to stay for a visit in the old town with its monuments, the countryside with its wineries and castles, for business trips or for a longer stay for your University courses. For any traveler or business man, after a whole day spent to have fun downtown or to work, this B&B is a comfortable, fine and elegant place where you can relax and enjoy a charming atmosphere. Casa di Osio was born thanks to Benedetta, an hotelier with long-time experience, who, together with her husband Matteo and her family, decided to create a cozy and hospitable B&B, reference point for those who want to discover the old town of Siena, and breathe its fascinating atmosphere, just like the famous middle-age travelers used to do.. The house has passed down within the family from generation to generation, Osio in fact was the grandfather who, with his wife Giselda, shared his love for this town and for hats. In the first years of 1900 he created the first milliners shop and in a part of the house he created his own laboratory. In the house there are 5 bedrooms which are very bright, carefully furnished and provided with all the mod cons. 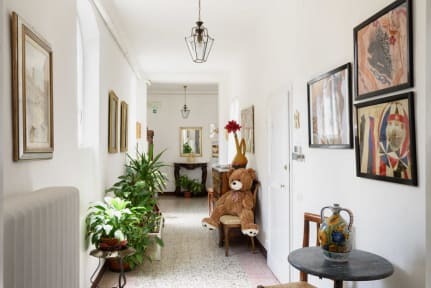 They are perfect for romantic stays, vacation with friends, for business trips ,for those who attend classes to the University or those who have to take care of their relatives hospitalized at the Policlinico Le Scotte. We have rooms with single beds or double beds; we can add a third bed or a crib on demand. The WIFI is free both in the rooms and in the rest of the house. There aren't rooms with private bathrooms, but in total there are 2 shared bathrooms with shower stall. We are on 3° floor.